A few weeks ago I made some little stuffed toys for the baby’s room… and then somehow a quilt sprung out of the same fabrics. Spontaneous combustion? It was more of a challenge than I initially expected! The pattern came from an older Fons & Porter publication (Fat Quarter Friendly). It suggested needle turn appliqué as an alternative to the curved piecing typically required for a classic winding ways quilt. Sounded good to me since I have needle turn experience but I haven’t tackled curved piecing yet. Trouble is, the points really need to line up in order to create the “winding ways” effect. After my first block I realized it definitely wasn’t going to happen by luck. After a restless night’s sleep I came up with the idea to piece the background blocks first and then sort of manipulate the appliqué points to approximately come together enough to create the design. It worked! But it was definitely challenging and a little backbreaking. I quickly decided to reduce the overall size of the quilt and add a border! That cut the number of blocks I needed from 20 to 9. Here it is before quilting. I hand quilted around all the appliqué shapes. And now I am feeling more ready than ever to have this baby! This entry was posted in Uncategorized and tagged applique, Finished Quilts, Hand quilting. Bookmark the permalink. Sarah, this is so pretty!! I always wanted to try this pattern. Thanks for the inspiration! 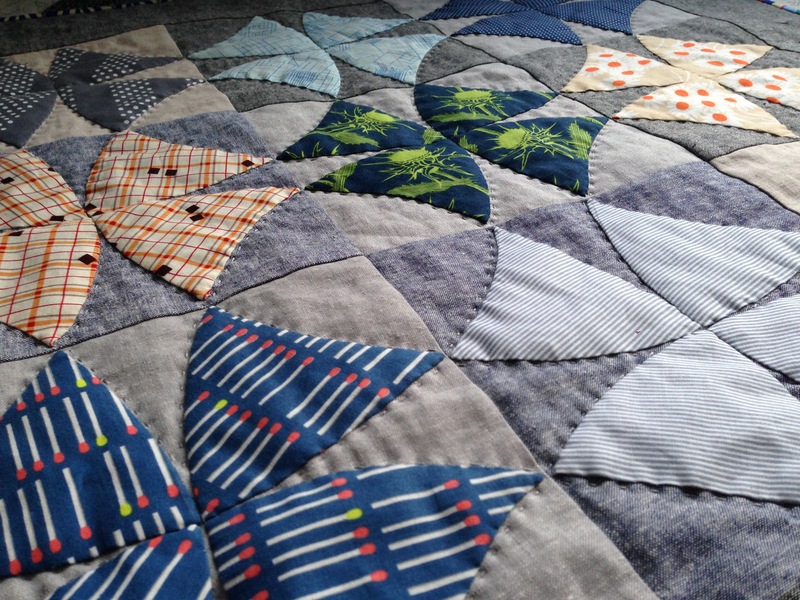 Sarah, love the hand quilting — sometimes I’m in such a rush that I forget how cool hand quilting looks and feels …. plus it’s relaxing! It’s beautiful Sarah. I now want to do something and hand quilt it. You never fail to inspire me. Such a Iucky (and loved) little guy # 3 bean will be and you are making it so welcoming. Oh WOW. I love the subtle boyishness of the fabric. And I think your decision to go with 9 blocks worked out so well. It’s perfect! Hi Sarah, I just have to comment on your stunning Winding Ways quilt! I have long admired this pattern and began my own a few years ago, hand-piecing of all things! Even then, I could NOT get it to match up well, so it sits waiting further attention. Appliquéing is such a good idea! Your hand-quilting looks lovely. 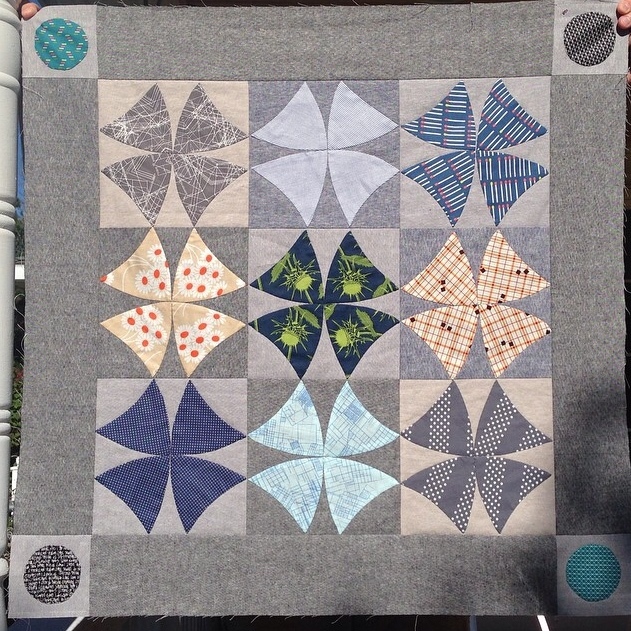 I am a exclusively a hand-quilter, and I love seeing others do it, too. Well done, you! I sure enjoy your blog – thanks for keeping it up even with the baby-in-waiting! It is a beautiful quilt!! I chuckled when I read that you cut the blocks from 20 to 9…something that i would have done too as i know how much work goes into hand applique!!! This is fantastic, love it!!! Lost for words. wow! I am so impressed. Curves and Hand quilting. Good for you! Looks really nice. Sarah, you did it! The effect and the quilting are perfect. Now for this perfect little boy to show up! Beautiful quilt – good luck! So lovely! The quilting is perfect! What a lucky baby! Brilliant and you can see a lot of hard work=love has gone into this quilt! Hope you are keeping well. Big hug from Italy! Congrats on sticking to it and finishing the quilt. It turned out lovely. I have made ONE winding ways quilt (pieced) and it was a challenge. Looks okay but not as perfect as I would like. Let’s call it a learning experience. 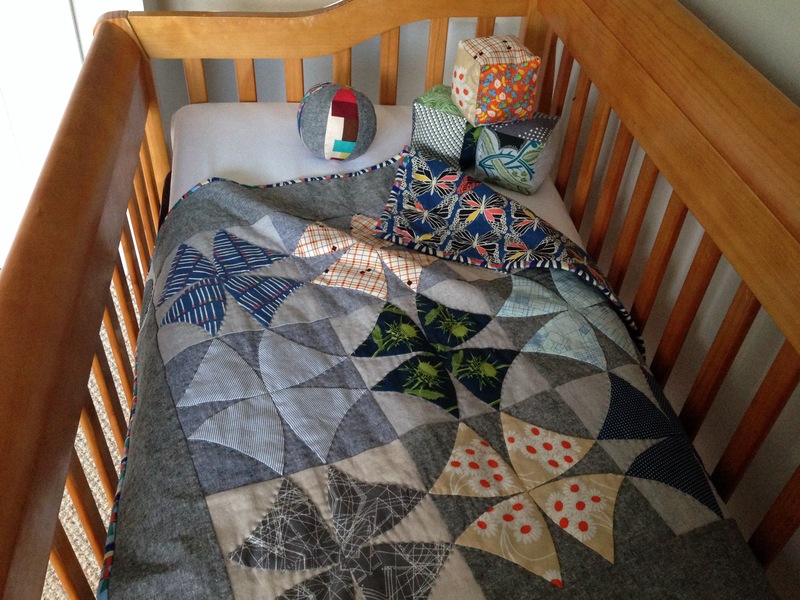 Sarah, this baby quilt is a beauty! I like how you changed the pattern up to reduce the number of blocks. The hand quilting looks fabulous and I’m willing to bet this quilt is extra soft too. I love the quilt and I’m sure it’s a favorite of your little one. Ageless.